A rented dumpster plays an important role in renovation or remodeling projects but it can also wreak havoc on property. Not only do you have to deal with the portion of the landscape or driveway where the dumpster is placed, you may also need to contend with the equipment required to drop off and pick up the dumpster. Good planning and a little preparation can minimize the potential for damage to the landscape, but you will most likely need to do at least a little site remediation once the dumpster is hauled away. Plan the project and dumpster position well. Whenever possible, have our driver delivering the dumpster place the dumpster on a driveway or other hard, non-vegetated surface. Some municipalities allow you to place the dumpster in the street temporarily, although a permit may be required. Choose a dumpster that is no larger than necessary to keep the area affected to a minimum. Bargain Dumpster is happy to help you choose an appropriate dumpster size for a particular project. 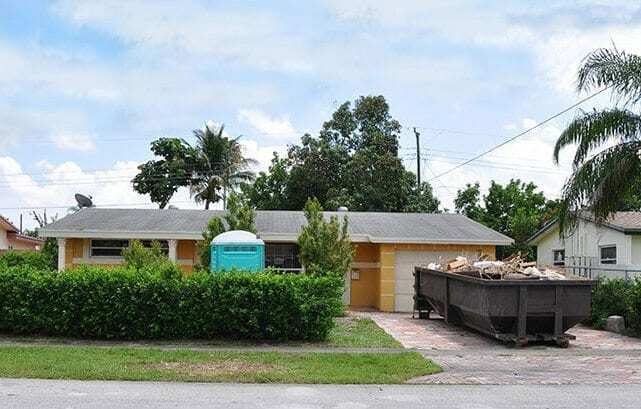 If possible, plan the dumpster delivery and pickup and your project so that you have the rental dumpster in your yard for as short a time as possible if it is positioned on top of grass, other vegetation or soil where tree or shrub roots are growing. The best way to protect the surface under the dumpster, whether it is lawn or a concrete or asphalt driveway, is to lay down plywood or pieces of wood where the dumpster will be placed and wherever the delivery truck and other construction equipment will be operating. Without the wood, parts of the dumpster and equipment can sink into the ground, leaving unattractive ruts and areas with extreme compaction. Even if a dumpster has wheels, because they are made of metal, they can still dig into or gouge both soft and hard surfaces, including driveway pavement. We require that you fill the dumpster up to a level just below the top of the dumpster and no more, or pile materials only 1 or 2 feet above the top, as we will need to cover the dumpster with a tarp to keep the debris from flying out during transport. However, for the sake of any soil and vegetation under the dumpster, especially if the soil is wet, it may be best to fill the dumpster up no more than about 75 percent of the way, or even just to 25 percent of its total volume if you are placing primarily bricks, blocks or other heavy material in the dumpster. Ideally, if the dumpster was positioned on turf, the full extent of the damage will be a yellowing or paling because the grass under the dumpster did not receive sunlight and it will quickly recover after the dumpster is picked up. If the dumpster or the truck that picked up the dumpster pushed the soil down, a hand or machine core aerator will alleviate compaction, restoring the movement of moisture and air to plant roots. 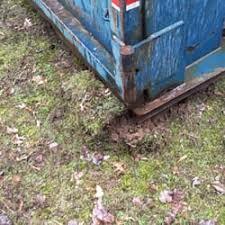 Where the dumpster or equipment left shallow ruts in the lawn but grass is still growing, force a garden fork under the grass roots in the rut and lift it up to just above the surrounding soil level to encourage recovery. For deep ruts with no grass growing, aerate the spot, fill it with high-quality topsoil and re-seed or lay new sod in the site. Once compaction is addressed, correct any remaining low spots by spreading a mixture of equal parts sand and compost into the low spots 1/2 inch at a time, adding no more than 1 inch total of the mixture each year. If the dumpster was left in place for a very long time or damage was significant, the grass under it may have died. If this is the case, plan to remove all dead grass and other debris, alleviate any compaction and spread new seed or lay sod in the site.